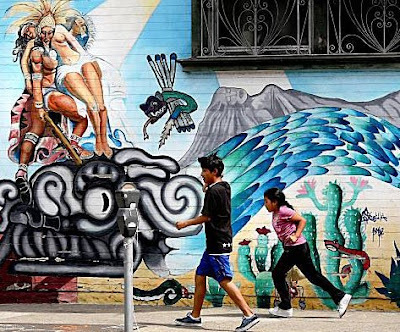 Children trot by Mexican artist Jesus Helguera's colorful "Leyenda Azteca" mural on the side of a bakery on 24th Street. The mural is about an Aztec volcano-creation legend, and the artist is sometimes referred to as the Norman Rockwell of Mexico. Nice article and photos in today's San Francisco Chronicle on the murals in the City's Mission District (with map).